Villa Marcy is situated on a hill with olive trees in the heart of the Chiana Valley in Tuscany, near Marciano della Chiana, a medieval town. 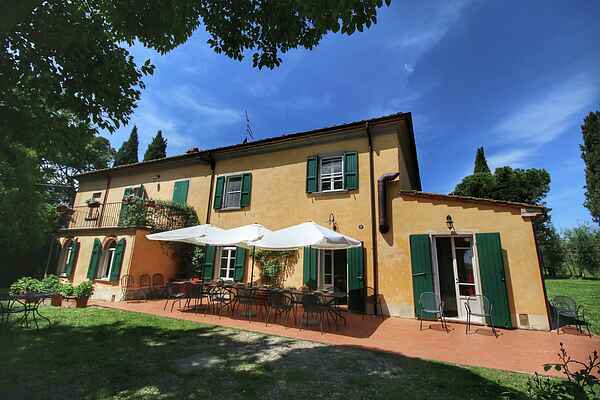 From the villa you have a panoramic view of the Val di Chiana and you can see the beautiful Cortona, Castiglion Fiorentino and the castle of Montecchio. During a recent restoration of this ancient and prestigious villa there are frescoes discovered that recall the former splendor of the villa. The villa is tastefully decorated. A small cottage with a double room is located next to the main building. The villa is surrounded by a 2 acre fenced park. There are wide lawns, a natural forest of oaks, maples and ancient cypress trees. There is also a large swimming pool in this idyllic spot of the Valdichiana. It is not only an ideal place to relax and rest, but it is also a strategic point to easily visit the most important cities of central Italy, such as Florence, Cortona, Arezzo, Perugia, Assisi, Siena, Montalcino, Pienza. Visit the fort and tower in the beautiful hamlet Marciano. From here you have a magnificent view to the Trasimeno. Perfectly restored and worth a visit! Go eat in the cozy restaurant Lo Steccheto in Marciano della Chiana; delicious food in a cozy place.